The newest item available from us for your F22 2 series is our Exotics Tuning style carbon fiber rear diffuser. This diffuser features 2x2 carbon fiber weave that will match CF mirror caps or spoiler you already have installed on your car. We complete the diffuser with a high quality clearcoat to ensure no fading or discoloring occurs even after years of use. 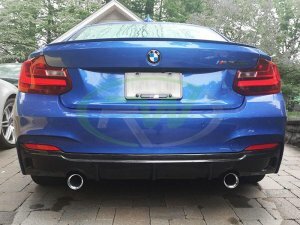 The carbon fiber diffuser will fit the M235i right out of the box, if you have the 228i you will need a dual exit aftermarket exhaust.